Fun fact - 2019 is year of the Pig according to Chinese zodiac. Consider me a piglet because I'm ready! We are so thankful for the year that was but our eyes are set on what is to come. We have set numerous goals for this year and our biggest focus is YOU. Through our social platforms we get to see your art work using Viviva and there is no greater feeling than seeing what YOU do. You inspire us. I'll save the sob story but, you put the U in Viviva - I know it doesn't work but just go with it (Oh Pizzle, stop). Talia is an artist extraordinaire traveling the globe illustrating and painting runway models with our Viviva sheets! I'm talking the Hadid sisters and Kendall Jenner... still waiting for Talia to illustrate me but...I'll wait. I spoke to Talia and asked her a series of questions in regards to her life on the road and as afull time artist using our colorsheets. Here's the Viviva low down from Talia! — How would you describe yourself and your profession? — My name is Talia Zoref and I am a Fashion Illustrator and Artist. — Where are you based? — I was born in Toronto and I am currently based in Tel Aviv. However, I travel a lot to Paris and Milan for work. — What are some of your biggest achievements? — I got commissioned to sketch for clients such as Fendi and MAC. I was featured in magazines such as Vogue and The New York Times and met and presented sketches to celebrities such as Mariah Carry, Kendall Jenner, and Bella and Gigi Hadid. — How do you incorporate Viviva? — I use Viviva all the time while I sketch at Fashion Weeks and in my trips around the world. Viviva’s vibrant colorsheets help me capture the moments I see wherever I am within minutes. — What are your favourite colours from our range? Why? — I love the Viridian color! First of all, it brings life to every drawing I create since it is strong but also since it is a rare shade of watercolor (I don’t usually see it in any other palettes). — If you could describe yourself as a Vivivacolour, which would it be? — I would want to be Magenta- Fun, Warm, Passionate and bold- not afraid to follow my dreams and do what I believe in. — Describe a day in the life of Talia using Viviva. — During Fashion Week I take my drawing tote bag wherever I go: (if it is a fashion show or a party, you never know who you will bump into and you always have to have your paper and colors ready). I put 2 Viviva Palettes inside alongside A4 paper, a black marker and my water pen.Than, whenever I see someone that inspires me I take my colors out and start drawing them. It is always fun and challenging to draw fashionable people on the go and with Viviva I can make the most out of every day of fashion week. — What are your 2019 goals/dreams? — Making the world a happier place with art and meeting more people that will inspire me. Ummmm how cool? If Talia doesn't make you want to just hop on a plane with Viviva to anywhere, I don't know what will. 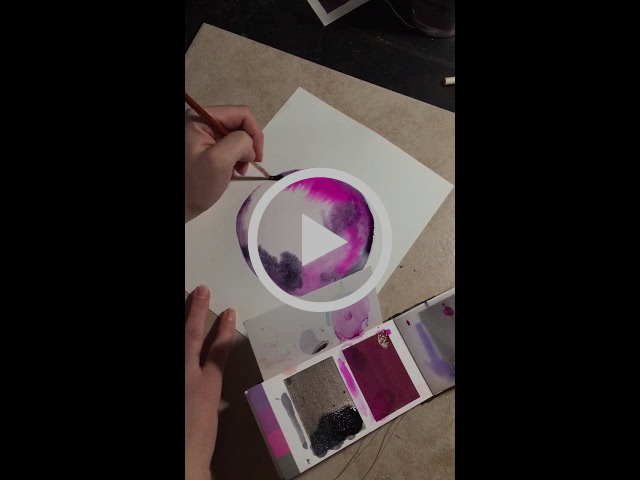 has an exciting video for you showing the use of our Mixing Tab! Our mixing tab is located at the back of our sheets and allows you to mix your colours together with ease. Check out Krystal creating the base of a galaxy using Viviva below! As always, thank you for your input and support within our community. I adore you all and I'm always humbled to be typing to you. I'll catch you at the next newsletter where I'm excited to announce our monthly prompt challenges using Viviva -whoop whoop! Our first blog post - introducing the theme of this blog!